This means we want to see Reds, Greens, Golds, Silver and White - a comination of any of these colors! I decided to use the stamp Winter Pine, a favorite one but I haven't used it in a while. I thought it was the perfect stamp for traditional colors. I picked the distress marker Fired Brick for the bow and berries, and Zig markers deep green for the leaves, bright yellow and mustard (these two were mixed to create a golden tone) for the pine cones. My Stamp Platform was used for stamping both the sentiment and image using Versafine Onyx and I sprinkled with Clear Embossing Powder to heat emboss. On the background I used the Penny Black background stamp Christmas Story and Antique Linen ink, but unfortunately the words don't show up well in the photo. They are much more visible in real life. To add some sparkle to the image I went over the whole image using Hero Arts Irridescent watercolor medium that came with the My Monthly Hero October kit (still available here). The glitter is barely visible in the photo above, although very shimmery in real life, but the photo below shows too much shine, it's not really this much in real life, just the right amount of sparkle. Not sure if you can tell, but I used the Penny Black background stamp Christmas Story to add some seasonal words to the background, using Antique Linen distress ink. Before adhering the layers to the card base, I used a distressing tool to distress the edges. A handy tool, but if you are careful you can also do this with scissors. The striped designer paper is from one of Stampin Up's retired Christmas paper packs. We have some great prizes this month again at Penny Black and More, and we would love for you to come join us! Remember, you may use any brand of stamps, just no digi stamps, and stamping must be the focal point of your creation. The only exception are Penny Black Stickeroos, but no digis and no dies as a focal point. Thanks so much for visiting! Please do check out the challenge blog for all the great prizes from our wonderful sponsors, and hope to see you joining in this month! Pretty card and I love your coloring! This is sooooooooo gorgeous! LOVING those pine cones!!!!!! Super card Ellie, lovely image and a really super sentiment stamp. 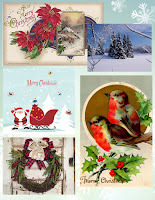 Lovely card, with a sweet colouring and a beautiful vintage look! such a lovely christmas card, ellie! suits the challenge colours perfectly and i love the subtle background stamping. Thanks Linda! That background stamp is so perfect for this time of the year! I've been using it a lot! A very pretty card and a great take on our photo challenge. I love the vintage look to your colouring. Thanks for joining us at Hand Stamped Sentiments this week. Happy I could join Hand Stamped Sentiments this week. Thanks so much for visiting! Pretty card. Great coloring. Thanks for playing with us at HSS. Great layout, I love the words in the background.